SARAH ELIZA: Tag: The Bloggers Made Me Buy It. 1. Who are your most influential bloggers? Who are the ones I rely on for reviews and swatches? There's obvious a few but for recommendations it has to be Brogantatexo. Sadly she dosn't post as much as she used to but when she was, her recommendations were perfect for me seeing we seem to have a similar skin type. For amazing reviews and swatches it has to be Milkteef; her reviews are always clear and so are the swatches but seeing as she tends to post mainly high end products, I drift towards Lilly Melrose's reviews for some drugstore products. 2. Do you buy a product solely as a result from one review from your favourite bloggers or do you look for reviews if others? I have to say I do check a few different reviews if I'm not 100% convinced the product is right for me but quite a lot of the time, if i see the product in stores and remember a blogger writing about it, I often just bite the bullet and buy it! 3. What is your favourite item you have bought as a consequence of blogs? 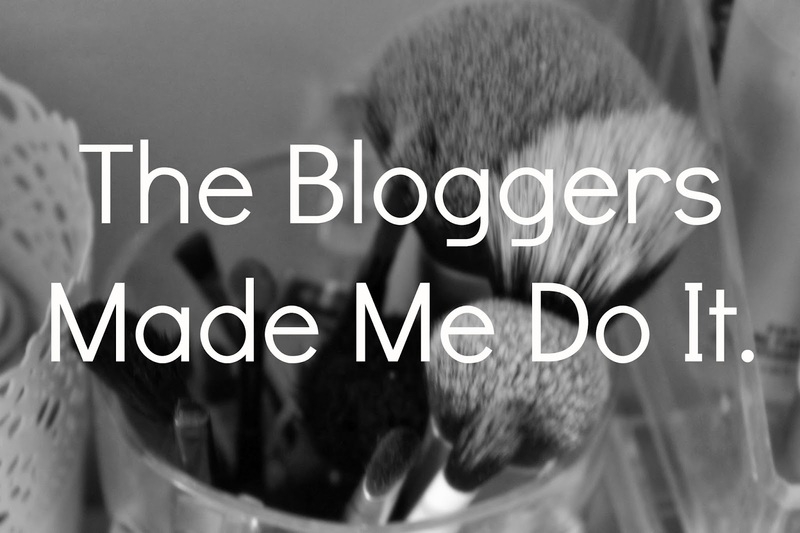 There is quite a lot as I do find most beauty buying ideas from the blogging world but probably seeing the amount of people talk about Mac Fix+ when I first joined the blogger world made me really want to buy it. I did write a full blog post a while back which you can read here. 4. What is your least favourite you have bought as a consequence of blogs? Probably my Bourjois Colour Boost Lip Crayon as I saw the hype carry on for so long and I ended up caving in. The colour I chose didn't suit me and the consistency isn't the kind I go for- it has a glossy finish and seeing as I'm more of a lipstick person, I'm not that keen. I have already mentioned this in products I regret buying which you can find here. 5. What are some items you recently bought because of blogs? The latest was probably Maybelline The Rocket Volume Mascara which I picked up just a week ago. I'm still not sure whether I like it or not as I can never tell when a mascara is brand new but we'll see. Also a Revlon Lip Butter in #001 Pink Truffle; I have a love hate relationship with these as, like I said, I'm not a glossy finish fan and also the price you pay for such little product is ridiculous. I would never have drifted towards the baby lips lip balms from Maybelline if t wasn't for the endless blog post and I absolutely love my lip balm in Cherry Me. Finally the Tangle Teezer hype was another that I'm so happy I decided to purchase one of my own. 6. Have you ever given in to a blogger hype? The question above seems to really answer this question but I have to mention the Barry M Gelly shine nail varnishes which I was sucked into soon enough and I absolutely love them! 7. Have you ever avoided a Blogger hype? I'd say any hype with higher end products from brands such as Mac and Nars as I'm not one to splurge on make-up but he biggest is probably Bioderma that everyone seems to love but I just stick with my L'oreal dupe! 8. Is everything ou buy based of blogger reviews or are there sometimes you buy without checking reviews? If I know what I'm looking for before i go shopping and it something that may effect my skin or such, I will read a review or two but if something catches my eye when I'm out I'll just pick it up without reading a review or if it's on offer! I hope you enjoyed this blog post and I'm going to tag you all!